Official synopsis: "Thousands of years ago the land is one dark forest. Its people are hunter-gatherers. They know every tree and herb and they know how to survive in a time of enchantment and powerful magic. Until an ambitious and malevolent force conjures a demon: a demon so evil that it can be contained only in the body of a ferocious bear that will slay everything it sees, a demon determined to destroy the world. Only one boy can stop it—12 year old Torak, who has seen his father murdered by the bear. With his dying breath, Torak’s father tells his son of the burden that is his. He must lead the bear to the mountain of the World Spirit and beg that spirit’s help to overcome it. Torak is an unwilling hero. He is scared and trusts no one. His only companion is a wolf cub only three moons old, whom he seems to understand better than any human. Theirs is a terrifying quest in a world of wolves, tree spirits and Hidden People, a world in which trusting a friend means risking your life." I genuinely do not know where to start with this one. Not at all. First off, I cannot believe in my four years of blogging I haven't reviewed this series yet! I did like a summary thing about my love for the whole series when I first started but since then, nothing. I know they've been out for a while but these books mean a lot to me and I've always intended to review them all, one by one. 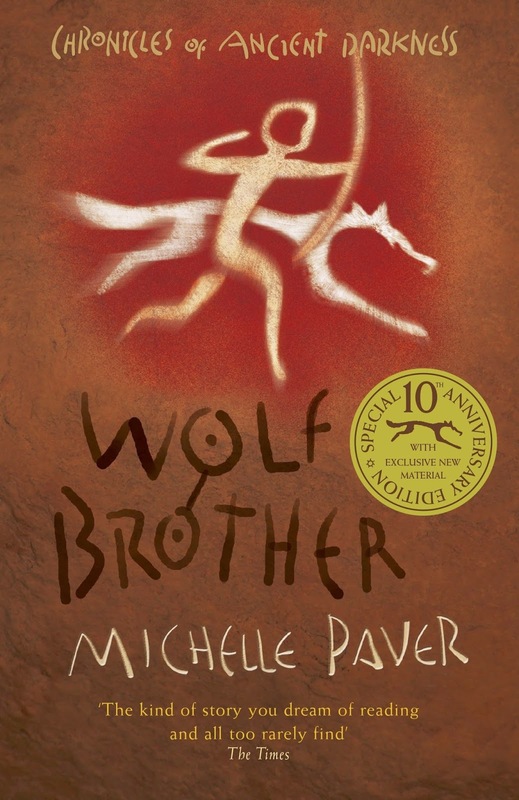 And what better time to start than the tenth anniversary of the publication of the first book, Wolf Brother? It hardly seems real. Ten years! Ten years? No way! Get out of here! It can't be ten years already, can it? Answer... Yes it can, and it is. I still remember the day I first saw Michelle and heard her talking about this book. I remember she was on Blue Peter, and I was in awe. She was in a grass field, talking to the presenter, don't ask me who, I can't remember, with a wolf, a real live wolf, walking beside her. She was talking about a book she had written about a boy named Torak who can communicate with a wolf cub, and is the only one who can rid the Forest of a demon bear that is terrorising it. Well, that was me sold! But enough about my past with this book. It's time to talk about the book itself... I decided that I should re-read the book, re-connect with it and re-learn it, before I reviewed it again. It has been a few years since I last read it and even the best of minds fail at some time and I really wanted to dive back into this wold again so desperately that the tenth anniversary feels like a good time to do that. so I picked up my old hardback and nestled down again, ready to be plummeted into the world of the Forest. Of hunter gathers, of clans, of animals and nature and magic and power and demon bears. And as soon as I started reading that first page, I fell instantaneously in love again. It was as if I had never left the leafy protection of a world that meant so much to the me of ten years ago when I fist read this book and as i continued to read this amazing series. Once again I was pulled into a world so real, so vivid and so well described that I could smell the damp bark, hear the soft crunch of leaves under my reindeer hide boots and almost taste the salty fat of a woodgrouse sizzling over a fire. Such is the magic of Michelle's writing. It's so captivating, so encapsulating, so rich. And I loved meeting the characters just as much as I did the first time too. Torak is one of my favourite main characters of all time. And Renn, Fin-Kedinn, Saeunn, the whole gang. Especially Wolf! And you know what, I had forgotten just how utterly chilling and terrifying some parts of the book are. The parts with the tokoroths, children possessed by demons, had me literally squirming as they did when I read them ten years ago. It was so good to relive these parts and I'm glad I had forgotten just how scary it was because I got to have those moments all over again. Shamefully there are bits that I had forgotten but that is the beauty of re-reading. It felt like I was experiencing it all over again and it was mesmerising and so so so much fun to delve back in to. In fact, I enjoyed myself so much that I want to read the whole series again, just to experience the magic all over again. I am glad to say that 22 year old Ryan loved Wolf Brother just as much as 12 year old Ryan did ten years ago. That's the true testament to a good story I believe. It transcends age. Yes, it was written primarily as a children's book, but ever since it was published it was well known that the book had massive crossover appeal and now as an adult, albeit a grossly immature one at that, I'm glad that that is the case. I had worried that it wouldn't stand the test of time and that my tastes might of changed over the years. I doubted that it would of because I adore her new series, Gods and Warriors, but the fear was there nonetheless. Thankfully it was unwarranted and left as soon as I opened the book. 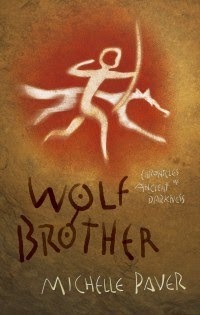 If you're a fan of all things nature, magic and adventure, then I implore you to pick up Wolf Brother and indeed the rest of the Chronicles of Ancient Darkness. Whether it is for yourself, your children, your nephews and nieces, cousins, friends, neighbours, whatever. Do it. Pick them up. These little books have so much to answer for as far as I am concerned - they kept me sane in a period of my life when it was very hard to even want to stay sane, they showed me a light that I didn't know was possible and inspired me beyond belief. Michelle knows how much of a fan I am - lord knows I've written to her enough times over the years - but I just cannot stress how much I love these books and think they deserve to be huge. They've done well but Michelle deserves so much more recognition where this series is concerned. It's gold and beautiful and rich and oh so tantalising. Thank you to Michelle for being so amazing and Orion Children's Books for publishing it in the first guys! Cannot wait to see you here for the 20th Anniversary! !